World's only Ski-Thru ATM returns with a "twist"
WHISTLER, BC, Feb. 7, 2018 /CNW/ - CIBC is pleased to announce the return of its Ski-Thru ATM to Whistler Blackcomb Resort, with an added feature this year. A 3-foot tall animatronic 3D penguin is ready to spin on top of the ATM when anyone tweets @CIBC using the hashtag #SkiThruATM. For every Tweet, CIBC will donate $1 to Alpine Canada, up to $10,000, in support of our three national ski teams: Canadian Alpine, Para Alpine and Ski Cross. 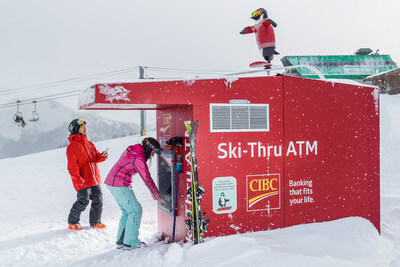 In January 2017, CIBC launched the world's first Ski-Thru ATM at Whistler Blackcomb Resort atop Whistler Mountain, complete with ski pole and glove holders and heating lamps, to deliver banking at clients' ski tips.